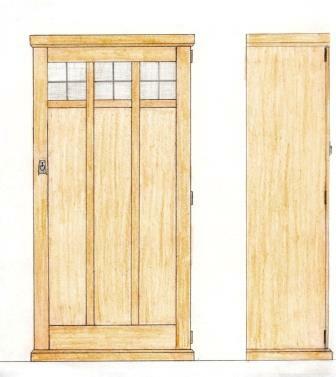 We produced a couple of these Oak Wardrobes, for the Editor of Period Living magazine (at the time). The style is unmistakeably Voysey / Arts & Crafts, combining the pared down feel of 'Mission' style with influences from Liberty and Mackintosh. Made from Oak, with a golden oak lacquered finish. Each door was fitted with a bespoke leaded window, using ripple glass (no stuck on lead here). They can be made to your own size, finish or style requirements. They could quite easily be used for built in wardrobes. Attention to detail is always the key to producing sucessful quality furniture - we produced bespoke antiqued copper handles & hinges for these robes. Measurements; ht 6' 6" / 1979mm x W 37.5" / 950mm x D 23.5" / 600mm. Please consider access to your house/room before discussing this further. We could make these to any size you want, or a built-in run of wardrobes in this style, complete with modern interior fittings. And yes, we know they look like the Tardis ! Production time approx. 7 - 10 weeks. The 2 upper pictures below are accurate for finished colour. The lower photo shows a robe without the glazed door panels. Top RH photo shows them both finished in the workshop. Most clients have a general idea of what they want but often find it difficult to translate into actual designs. This is what I specialise in. I take your ideas & often will produce several sketches that fulfil the design brief in different ways. This allows you to choose exactly the design you prefer, or choose elements from several designs to arrive at a finished design. The LH design above was the one chosen for this job, but they were also presented with a 3 panel door version.